^ a b c d e f g Hatch, Thom (2002). The Custer companion: A Comprehensive Guide to the Life of George Armstrong Custer and the Plains Indian Wars. Stackpole Books. pp. 114–115. ISBN 0-8117-0477-7. https://books.google.com/books?id=0wS5dfCYhtAC&pg=PA115&dq=Bloody+Knife+Custer+scout&hl=en&ei=cYmfTse7B4H50gH40YCMBQ&sa=X&oi=book_result&ct=result&resnum=3&ved=0CEIQ6AEwAg#v=onepage&q=Bloody%20Knife%20Custer%20scout&f=false. ^ a b c d e f g Logt, Mark Van de (2011). Tucker, Spencer C.. ed. The Encyclopedia of North American Indian Wars, 1607–1890: A Political, Social, and Military History. ABC-CLIO（英語版）. pp. 78–79. ISBN 978-1-85109-697-8. https://books.google.com/books?id=JsM4A0GSO34C&pg=PA79&dq=Bloody+Knife+Custer+scout&hl=en&ei=zIyfTob-K8Hu0gGr59DeBA&sa=X&oi=book_result&ct=result&resnum=4&ved=0CEcQ6AEwAw#v=onepage&q=Bloody%20Knife%20Custer%20scout&f=false. ^ a b c d e Connell, Evan S. (1984). Son of the Morning Star. North Point Press. pp. 12–18, 102, 211, 272, 379.. ISBN 0-86547-510-5. https://books.google.com/books?id=6xpX2kXm6iYC&pg=PA96&dq=Son+of+the+morning+glory+12&hl=en&ei=asugTrPqNuLb0QGE5vWUBQ&sa=X&oi=book_result&ct=result&resnum=8&ved=0CFUQ6AEwBw#v=onepage&q&f=false. ^ a b Donovan, James (2008). A Terrible Glory: Custer and The Little Bighorn—The Last Great Battle of the American West. リトルブラウンアンドカンパニー（英語版）. ISBN 978-0-316-02911-7. https://books.google.com/books?id=6Zg0Adpk8EsC&pg=PT35&dq=Bloody+Knife+mutilated&hl=en&ei=YrGgToW2CcXh0QHKpezkBA&sa=X&oi=book_result&ct=result&resnum=4&ved=0CDsQ6AEwAw#v=onepage&q=Bloody%20Knife%20mutilated&f=false. ^ a b Larson, Robert W. (2007). Gall: Lakota War Chief. オクラホマ大学出版（英語版）. pp. 55–56. ISBN 978-0-8061-3830-5. https://books.google.com/books?id=CKfgaawJrXcC&pg=PA55&dq=Bloody+Knife+scalped&hl=en&ei=vM2gTq-7KcTW0QH5_4nfBA&sa=X&oi=book_result&ct=result&resnum=5&ved=0CEcQ6AEwBA#v=onepage&q=Bloody%20Knife%20scalped&f=false. ^ Mitchell, Steven T. (2011). Nuggets to Neutrinos. Xlibris. pp. 94–95. ISBN 978-1-4568-3947-5. https://books.google.com/books?id=qZKGnfPIvWUC&pg=PA123&dq=Bloody+Knife+Custer+scout+nuggets+to+neutrinos&hl=en&ei=-A2mTuS_NKrr0gGGo6CWDg&sa=X&oi=book_result&ct=result&resnum=1&ved=0CC4Q6AEwAA#v=onepage&q&f=false. ^ a b c Elliott, Michael A. (2007). 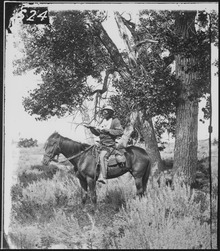 Custerology: The Enduring Legacy of the Indian Wars and George Armstrong Custer. シカゴ大学出版局. pp. 160–161. ISBN 978-0-226-20147-4. https://books.google.com/books?id=cpjYkhUbbKsC&pg=PA161&dq=Bloody+Knife+Custer+scout&hl=en&ei=acClTrr6HYns0gHv4LCPBQ&sa=X&oi=book_result&ct=result&resnum=10&ved=0CF4Q6AEwCTgo#v=onepage&q=Bloody%20Knife%20Custer%20scout&f=false. ^ a b Powers, Thomas (2010). The Killing of Crazy Horse. ランダムハウス. pp. 81–82. ISBN 978-0-375-41446-6. https://books.google.com/books?id=z8mVZ0Ky9_IC&pg=PA81&dq=Custer+bloody+knife&hl=en&ei=CxuqTrWmAqLa0QGP84H_Dg&sa=X&oi=book_result&ct=result&resnum=6&ved=0CEQQ6AEwBTge#v=onepage&q=Custer%20bloody%20knife&f=false. ^ Lehman, Tim (2010). Bloodshed at Little Bighorn: Sitting Bull, Custer, and the Destinies of Nations. ジョンズホプキンス大学出版（英語版）. pp. 74–75. ISBN 978-0-8018-9500-5. https://books.google.com/books?id=7G_fmi0vLCEC&pg=PA75&dq=Bloody+Knife+Custer+scout+grizzly&hl=en&ei=hYKjTvrdJ-Hm0QHMs8zTBA&sa=X&oi=book_result&ct=result&resnum=5&ved=0CEEQ6AEwBA#v=onepage&q&f=false. ^ Nichols, Ronald Hamilton (1999). In Custer's shadow: Major Marcus Reno. オクラホマ大学出版（英語版）. p. 180. 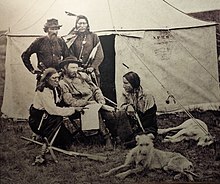 ISBN 0-8061-3281-7. https://books.google.com/books?id=72e4CqdiYtAC&pg=PA180&dq=Bloody+Knife+In+Custer's+shadow:+Major+Marcus+Reno&hl=en&ei=Eki3TrndHqbV0QHnhPSlBA&sa=X&oi=book_result&ct=result&resnum=1&ved=0CC0Q6AEwAA#v=onepage&q&f=false. ^ Tucker, Spencer C. (2011). The Encyclopedia of North American Indian Wars, 1607–1890: A Political, Social, and Military History. ABC-CLIO. p. 35. ISBN 978-1-85109-697-8. https://books.google.com/books?id=JsM4A0GSO34C&pg=PA79&dq=Bloody+Knife+Custer+scout&hl=en&ei=zIyfTob-K8Hu0gGr59DeBA&sa=X&oi=book_result&ct=result&resnum=4&ved=0CEcQ6AEwAw#v=onepage&q=Bloody%20Knife%20Custer%20scout&f=false. ^ Campbell, Ballard C. (2008). Disasters, Accidents, and Crises in American History: A Reference Guide to the Nation's Most Catastrophic Events. インフォベース出版（英語版）. pp. 142–143. ISBN 978-0-8160-6603-2. https://books.google.com/books?id=VitlO1mWxzAC&pg=PA1874-IA1&dq=Battle+of+Little+Bighorn+US+military+defeat&hl=en&ei=jym_Tri8H6X10gHw-ZmCDA&sa=X&oi=book_result&ct=result&resnum=3&ved=0CDkQ6AEwAg#v=onepage&q=Battle%20of%20Little%20Bighorn%20US%20military%20defeat&f=false. ^ Browning, James A. Violence Was No Stranger (1993). Barbed Wire Press. 0-935269-11-8.